The Jamesville Primitive Baptist Church featured the classic two-front door type of entrance as was prevalent for most of the Primitive Baptist churches; one for the men and one for the women. The building is rectangular in shape with few adornments as was also the standard for this religion. It does, however, have large boxed cornices with deep frieze that returns to frame the front gable. This is part of the Greek Revival design which was popular during the antebellum period. The structure also has louvered gable vents and (at one time) featured the nine-over-six sash windows. The Jamesville Primitive Baptist congregation was started in 1827 with about fifty members from the Skewarkey Baptist Church left to form a new congregation, known as Picot, about halfway between Williamston and Jamesville. Among those influenced by the church was young Clayton Moore (1814 – 1881), who later became a wealth planter. 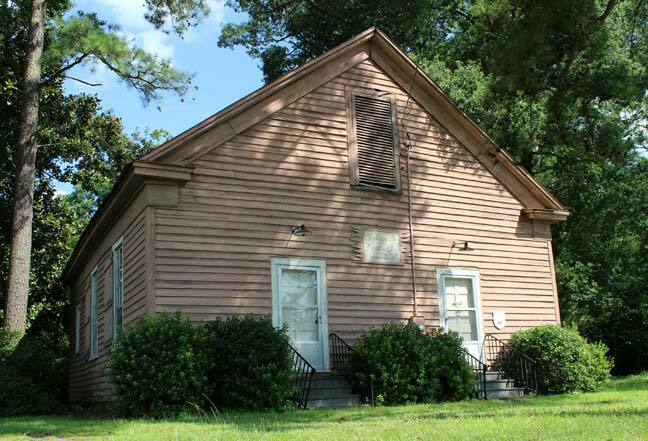 Moore became licensed to preach and served as pastor of this church from 1847 until his death. Moore was a strong supporter of the Confederacy and as a result of his support, his plantation house was burned by the Union troops during the war. At the end of the war, the land-rich but cash-poor Moore struck a deal with the congregation: if it would give him the church building (presumably for use as a temporary dwelling), he would later build a new church in Jamesville. By 1870, the congregation occupied its new structure (this building) and changed its name to the Jamesville Primitive Baptist Church. Through the years the membership and activities declined. Then in 1953, Luther Hardison, the last surviving member and deacon, deeded the church property to the Jamesville Women’s Club. The building was converted to accommodate the club’s needs by adding partitions, a kitchen and bathrooms. Some of the original pews were kept for seating.